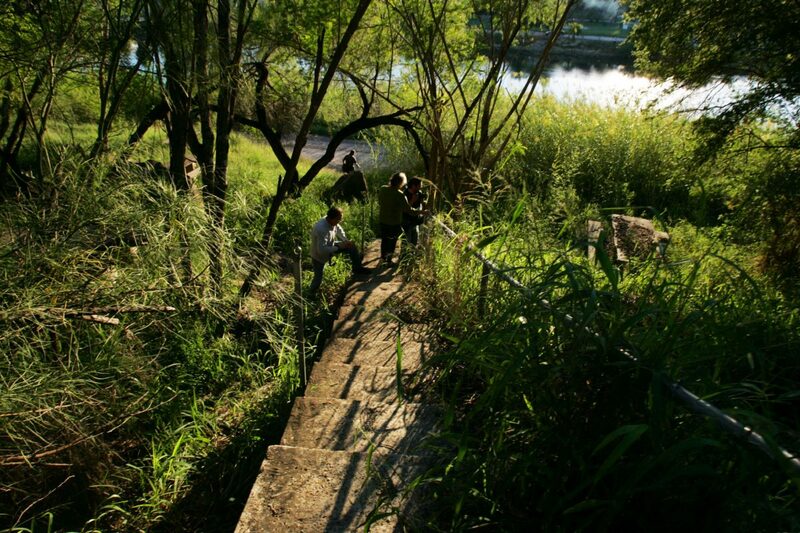 Visitors walk along stairs that lead to the Rio Grande along the Roma Bluffs Tuesday, October 17, 2017, in Roma. Starr County residents will soon find out how border wall construction will affect them. That’s because notices for landowners in the western edge of the Rio Grande Valley will begin arriving in about three weeks, according to Roma Mayor Roberto Salinas. Salinas said that information was conveyed to him and several officials from other cities in the county Monday during a meeting with U.S. Border Patrol and U.S. Customs and Border Protection. Last week, CBP and Border Patrol officials confirmed that landowners in Hidalgo and Starr counties would “immediately” begin receiving notices regarding construction along the U.S.-Mexico border as it pertains to their land. The meeting Monday with Starr County leaders was directly related to that announcement last week — in which CBP and U.S. Army Corp of Engineers officials said they would begin reaching out to landowners in the Valley to conduct “Rights of Entry for Survey,” or (ROE-S), in order to commence the real estate, environmental and design processes for the border infrastructure projects that were funded in CBP’s 2018 fiscal year plan. “The Rio Grande Valley sector is slated for 25 miles of new levee wall along the Rio Grande River and 8 to 12 miles of bollard wall in Starr County, Texas — closing gaps along the border in the RGV sector is also part of the border wall project,” CBP announced following the omnibus bill’s passage at the end of March. According to Salinas, landowners in the Starr County area will receive notification from the federal government within three weeks regarding the segment of wall and fencing in the county. Salinas said he and other city officials were told during the meeting that the wall construction would begin east of the Fronton area and extend 5.5 miles into Escobares, but uncertainty remains regarding the downtown area. The mayor also said that in addition to himself, he was joined by officials from Rio Grande City, Escobares and La Grulla. During the gathering, Salinas said they were shown a map that outlined the plans — but the officials were not provided a copy of the map. Last July, CBP officials released a map of Starr County that showed some areas that were marked for wall construction, but it is unclear if that map represents the recent details shared with officials on Monday. Scott Nicol, an environmentalist and executive board member with the Lower Rio Grande Valley Sierra Club, said if the map provided by CBP last summer holds true, the wall’s placement would violate a longstanding treaty between U.S. and Mexican officials, which does not permit obstructions along the floodplain that would push water into either the United States or Mexico. Nicol is referring to the 1970 Boundary Treaty between the United States and Mexico, which in part states that each country prohibit obstructions that would disrupt the normal flow of the river. “Both in the main channel of the river and on adjacent lands to a distance on either side of the international boundary recommended by the Commission and approved by the two Governments, each contracting State shall prohibit the construction of works in its territory which, in the judgment of the Commission, may cause deflection or obstruction of the normal flow of the river or of its flood flows,” the treaty reads in part. Lori Kuczmanski, spokeswoman for the U.S. International Boundary and Water Commission, declined to comment when asked about the long-standing treaty between the two countries, and any potential violations that may result due to border wall construction, and instead referred questions to CBP. Last October, Nicol and attorneys with the Texas Civil Rights Project hosted an information session in Roma for Starr County residents who had concerns about the proposed construction plans. During the session, Efren Olivares, an attorney with TCRP, gave a presentation to landowners of their rights with regard to the government’s potential attempt to buy land from landowners. At the time of the October 2017 meeting, Nicol showed those in attendance the map released by CBP in July of that year, showing the areas that were tentatively planned for construction. But many residents left that meeting with more questions than answers due to little to no contact with the Border Patrol and CBP officials who did not attend the meeting. Now with the news of specific plans and locations for the construction, Nicol worries the construction would be in violation of treaties that were designed to protect people living near the boundary from potential hazards due to flooding. Salinas echoed Nicol’s concerns about potential flood hazard in areas along where the construction is planned. He said there was concern among city officials Monday that (the walls) might cause flooding in some locations. “ … All that would be addressed in the engineering portion of the study but that hasn’t been done,” Salinas said Tuesday. This story was updated to reflect that Monday was the day in which the meeting was held.